Many of you may already have your Christmas trees home, but there’s a small portion of you who don’t. For those of you planning on buying a real tree, we wanted to share these tips from Cars.com about the proper way to get it home. 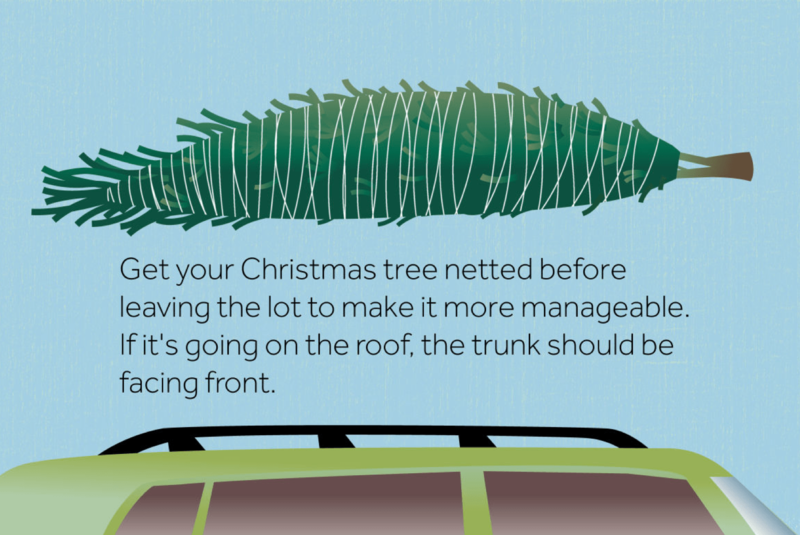 Get your Christmas tree netted before leaving the lot to make it more manageable, and if it’s going on the roof, the tree’s trunk should be pointed toward the car’s front end. Both of these tips will help reduce wind damage to the pine needles. Make sure to select a tree that will either fit inside your car’s cargo area or, if you have a roof rack, on top of your roof properly. Also ensure that you have enough rope or cord to wrap around the tree and secure it to the roof rack or to the cargo hooks. Place a tarp or blanket over the cargo area to protect the interior from loose needles. If you’re going to place the tree on the roof, place a tarp, plastic sheet or blanket between the tree and the roof rack to protect the roof from scratches. If you are transporting a tree in a pickup truck, there could be hot spots in the truck bed — from the exhaust pipe, for example. This can damage the tree’s needles, so put something under it like an old blanket. Before leaving the lot, give the tree a good tug to make sure it’s secure. Drive slowly and avoid the highway, especially if you’re not used to hauling heavy objects on your car’s roof. They affect your vehicle’s center of gravity and emergency handling. Don’t forget to keep your windshield clear and avoid debris! Have questions about your windshield? Stop by Auto Glass Maxx today. We’ll love to help you.